Southeast Ohio Blog: This is it. Today is the final day to finish work on this issue of Southeast Ohio. It's exam week, and an air of tension pervades campus, slowly lifting as the week goes on and more students finish their finals, breathing a sigh of relief. We've been busy around here: the editors and Ellen have been in the newsroom since this morning and other staff members have popped in and out throughout the day to complete final edits. Copies of each page of the magazine are spread on the floor in front of the newsroom and staffers are busy scrutinizing each one to catch misspelled words or missing commas. In her "typical nervous fashion" (her words) Ellen says she's worried about missing mistakes, because the editing process has gone surprisingly smoothly today. 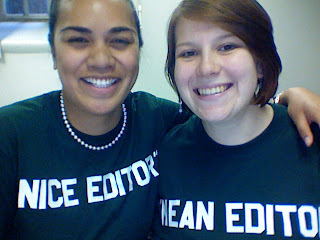 Carissa and Karen are decked out in their "Mean Editor," "Nice Editor" T-shirts and they mean business. Ellen says she's pleased with this issue, especially because we have a nice selection of action stories and photos, from barrel racing to wrestling to a zip line. "It feels like a summer-fall issue," she says. I think everyone on staff is proud of the work we have done, and we can't wait to see the final magazine. It's a pleasure and a honor to have been a part of this staff. Finally, the Southeast Ohio web site is officially updated, thanks to the diligence of web staff. Updating the events pages has been an arduous process, but the pages are completed! Check them out to discover the exciting events happening in our area this summer and fall. Thanks for reading along-- make sure to check out the magazine and the website! Can't wait to see the magazine! Thanks for the behind-the-scenes insight into SEO.